During years of going to ground zero every Sept. 11, Tom Acquaviva has seen crowds diminish at the ceremonies commemorating the terror attacks. But his determination to participate hasn't. "As long as I'm breathing, I'll be here," Acquaviva, 81, said Friday as he arrived to pay tribute to his late son, Paul. More than 1,000 victims' relatives, survivors and recovery workers marked the 14th anniversary at ground zero with grief, gratitude and appeals to keep the toll front of mind as years pass. "It's a hard day. But it's an important day. I'll come every year that I can," recovery worker Robert Matticola said. Firefighers ring a bell to mark the moment the second tower fell. "You are the reason that I wear this uniform and stand here today," Air Force Technical Sgt. Sparkle Thompson said of her uncle, Louie Anthony Williams. In Washington, President Barack Obama and first lady Michelle Obama stepped out of the White House for a moment of silence at 8:46 a.m., when the first of four hijacked planes hit on Sept. 11, 2001, striking the World Trade Center's north tower. Later Friday, the president told troops at Fort Meade in Maryland that he hoped Sept. 11 would inspire thoughts of what binds the country together, while Vice President Joe Biden praised New Yorkers' resilience in remarks to bikers and police officers taking part in a 9/11 memorial motorcycle ride. The Flight 93 National Memorial near Shanksville marked the completion of its $26 million visitor center, which opened to the public Thursday. At the Pentagon, Defense Secretary Ash Carter and other officials joined in remembrances for victims' relatives and Pentagon employees. Other observances were held around the country. 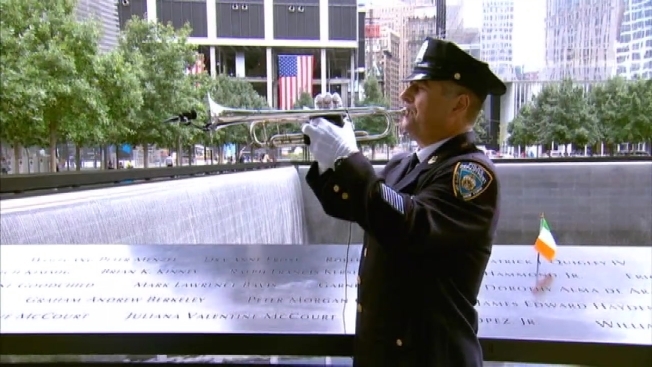 Sept. 11 is especially hard for New York's Bravest, who lost 343 members that day. 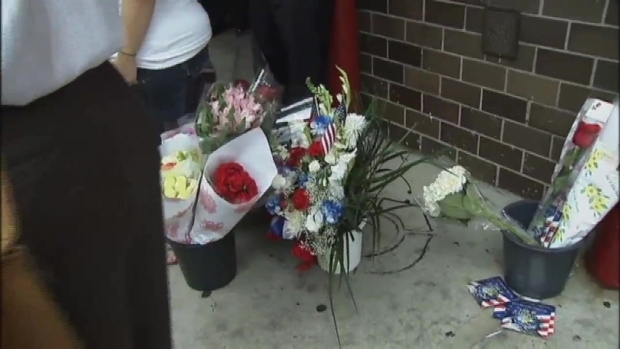 On Friday, they honored the fallen with a ceremony at the Manhattan Firehouse known as "The Pride of Midtown." That house lost 15 members. Jen Maxfield reports. "I don't go to the memorial. I don't watch it on TV. 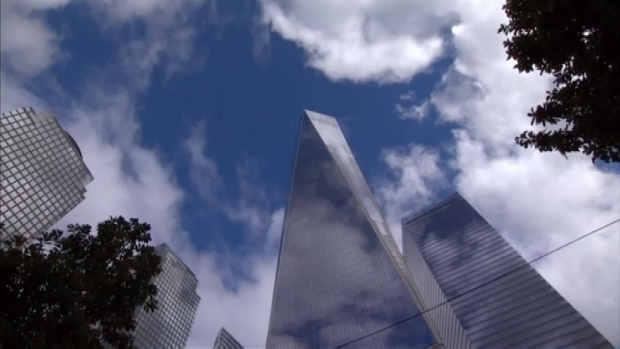 But I make sure, every year, I observe a moment of silence at 8:46," electrician Jeff Doran said as he stood across the street from the trade center, where the signature, 1,776-foot One World Trade Center tower has opened since last Sept. 11. Some victims' relatives welcome the openness after years when the site was largely off-limits for construction. "It's a little more comfortable for people to be here," said Alexandria Perez, who lost her aunt, Ana Centeno. But to Erick Jimenez, a brother of 9/11 victim Eliezer Jimenez Jr., "every year, it's a little less personal," though he still appreciates being with others who lost loved ones. This year's anniversary comes as Congress is weighing whether to start providing financing for the memorial plaza and whether to extend programs that promised billions of dollars in compensation and medical care to Sept. 11 responders and survivors. They're set to expire next year. "People are still dying because of what happened," both on battlefields and from illnesses that some responders have developed after exposure to toxic dust, Army Sgt. Edwin Morales said as he arrived at ground zero in remembrance of a cousin, firefighter Ruben "Dave" Correa. The pain of 9/11 attacks stretched across the Hudson River to New Jersey where many of the victims called home -- more than 700 New Jersey residents were killed in the terror attacks. On Friday, they were honored in communities across the state. Pat Battle reports. "My kids and I would like to humbly thank everyone who has helped us, through the last 14 years, to be able to gently go through the sorrows, the suffering, the pain," she said. "Thank you all very much — the city, the nation, the friends, the family."